La Hostería in Arequipa - Official Website. La Hostería is located in the Historic Center of Arequipa, a place full of living history and architectural beauty. Also known as "White City" for its buildings made in ashlar, or as the "Eternal Blue Sky" for its extraordinary climate, in our hotel we invite you to discover every last corner while enjoying a perfect stay. Our hotel is a colonial house of outstanding beauty that preserves its art from its bases. The patios, pergolas, balconies and terraces full of colorful flowers and the careful decoration make our guest travel in time and enjoy a unique experience. La Hostería presents a fusion between history, art and a luxurious stay with quality services. In each of our rooms you will find all the comforts and the best equipment. Includes: 2 nights and 3 days in a superior double room, with breakfast included, with rafting in the Chilina Valley. Includes: 2 nights and 3 days for 2 people in a superior double room, breakfast, transfer, Hot Stone Massage and a tour in the wonderful tourist places of Arequipa. * Lunch and dinner are not included. At La Hostería we have a main objective, to offer quality services so that your days with us are more than a stay. In addition to our comfortable rooms full of style, you can enjoy the spa and the Roman bath. 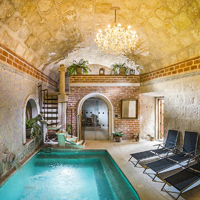 The spa and Roman bath offer an unbeatable atmosphere; you can take care of your body and mind in an exceptional place as they are inside an ancient ashlar vault belonging to the second period of the neoclassical period. On the other hand, we also offer different gastronomic offers. Start your day with an exquisite breakfast buffet in our cafeteria or savor delicious dishes in our Pizzeria at the La Hosteria. Enjoy a comfortable stay in our fully equipped rooms. Take care of your body and mind, relax and enjoy the healthful properties of Roman baths. Travel through the palate with the best dishes of Italian cuisine made with local products. Our hotel is located in the heart of the impressive historic center. Discover every corner.